When we first bought our house the porch was a blank canvas. I made curtains for the french doors, hung a swing that my grandfather built, moved the mailbox up from the yard, and got some comfy chairs. 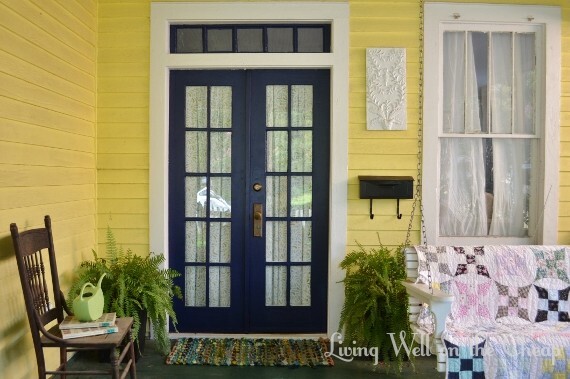 Over time I added plants and decor, painted the doors blue, and stripped the paint from the original brass hardware. I was never really sold on the teal doors. Even as I painted them I felt insecure about it. It seemed like a sort of juvenile choice for such an old house. But there wasn’t a doubt in my mind as I rolled on the navy paint. It’s perfect. I feel like it adds so much more character than the white doors we inherited but is more sophisticated than the teal. And put together with the ferns I have yet to kill, the colorful rug, the old-fashioned mailbox and the wall decor (a thrift store find that I painted white) the whole effect is like a little microcosm of my decorating style and a preview of what lies inside. It’s funny how such a small change can be so refreshing! And at the same time, it feels like it was always this color. The craziest thing is that I have always, always, always wanted to repaint the porch floor. Ever since we bought this house I have hated the green and wanted to paint it gray instead. But now with the navy door the green is growing on me. It helps that I gave it a good cleaning recently, but I also think that the traditional colors just complement each other nicely. I’m still not ruling out that I’ll paint it someday, but it’s not the glaring eyesore that it once was. I hope you all had a wonderful weekend. Ours was the kind that felt like it lasted forever but was full of ups and downs. On Saturday we visited family, including my grandfather on my mom’s side who is really not well (put that in the “downs” column). On Sunday Nick took Jack to the zoo while I studied for my LCSW. And today my Pawpaw Gulley (who’s been staying with us for two weeks) is moving into his new apartment! There’s been so much going on with us lately but I’m not ready for summer to end. I hope August lasts forever. I did really like the teal, I didn’t think it was juvenile at all! But I also really like the blue. It is a whole new look. Can you see it from the street? The difference isn’t huge from the street but it’s visible. I need to take new pictures for the house tour page! The navy looks great, especially with the brass hardware! Lovely! It’s perfect! It really makes the hardware pop. Thank you! It makes me want to strip the hardware on some of the interior doors now! Love! Really, it looks so sharp. I’d love to see a picture of it from your yard or the street. Thanks! I’m definitely gonna take some updated pictures. Can’t decide if I should wait until I get my lawn mowed so I can use the same pics for my house tour page or just go ahead and snap some pics with my scrubby overgrown grass. Blogger problems! Looks great. What color is the yellow. That is very pretty. I’m not sure! The house was painted this color when we bought it. I love it though! Thanks. Too bad, shopping for house colors.